Removing trees yourself is not always an option. However, it can be very expensive to have someone come do it for you. This is a guide to saving money on tree removal. A tree that topples at the wrong time or in the wrong place can cause significant damage to your home and property. Worse yet is the possibility that it could injure or kill someone. Here are some guidelines to help you recognize whether or not a tree has become a hazard, and as well as some steps you can take to correct the situation. The U.S. Forest Service defines a "hazard tree" as one with structural defects that are likely to cause the failure of all or part of the tree, which could result in striking a "target." A target can be a vehicle, building, or a place where people gather such as a park bench, picnic table, street, or backyard. Age: Older trees have been exposed to environmental factors for many years and may become hazardous due to the accumulated effects of age. Young trees are susceptible, too. Aspen, for example, are known to be prone to breakage when they are young due to decay and disease. Tall trees are susceptible to lightning strikes, which can jump to nearby buildings. Species: Some tree species are more susceptible to injuries. For example, splits can occur on the trunk of the tree as well as on branches. Trees which are most susceptible to this type of injury are those which are thin-barked, such as certain fruit trees. Maple and ash are prone to weak branch unions, while birch tend to "self-prune" as they decay, eventually leaving only a hollow trunk. Location: Trees bordering wooded areas, roads, driveways, and parking lots, risk greater exposure to storms and other environmental stressors. Trees near construction zones may suffer root damage during land clearing. Those growing in saturated or shallow ground are more susceptible to toppling due to the ground giving way. An annual visual inspection of your trees is a good way to spot potential problems. A pair of binoculars can help you assess the hard-to-see upper branches of tall trees. A tree with defects only becomes hazardous when it has the potential to hit a target. Keep in mind though, that not all defects are structural. A tree appearing structurally sound can still be a hazard if it obstructs the view of a passing motorist, causes a sidewalk to buckle, or interferes with nearby power lines. Does the tree appear healthy? Does it still produce needles or leaves? Has the tree lost large branches recently? Are any of the remaining branches dead? Are wide (or deep) cracks visible in the trunk, branches, or branch unions? Is the tree producing heavy new growth around topping cuts? Are there broken branches dangling from the tree? Are branches close to interfering with power lines or windows? Are the roots causing damage to a nearby foundation? Are fungus (mushrooms) growing on the tree's roots? Are hollows or cankers (dead spots) visible on the trunk? Is the tree leaning? If the tree falls, could it hit a car, house, utility line, or person? 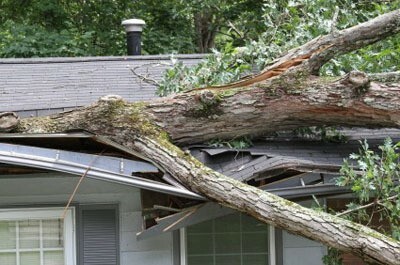 Have the roots, trunk, or branches been recently injured by storms or construction? If you answered yes to one or more of the above questions, you may want to have the tree evaluated by a certified arborist or tree professional and give you recommendations on corrective action. Before deciding what action to take, investigate your options. Relocating the target. It's a cheap and easy solution, but one that's often overlooked. If target objects like swing sets, cars, and picnic tables can be physically relocated, your problem is solved. Corrective pruning. You may be able to remove dead or damaged roots and/or branches through pruning without having to disturb the rest of the tree. Removal. If over 30 to 50 percent of the main branches or trunk are severely split, broken, or mutilated, the benefit of extensive repairs is probably questionable. This is usually a job best left to the professionals. 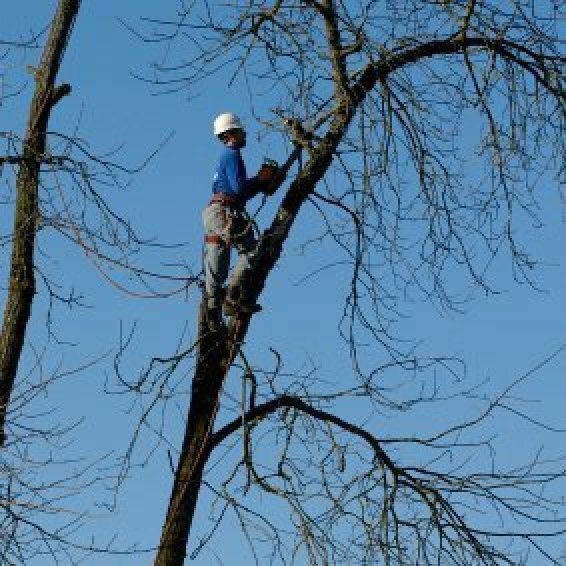 When getting estimates for work, look for companies that employ certified arborists. Make sure they carry the proper state certification and licenses and that they are fully insured. You can find one near you by visiting http://www.treesaregood.com and typing in your zip code. Trees don't live forever, but removing the hazard doesn't always mean removing the tree. Always consider the risk as well as the long-term consequences. Then try to create a landscape plan that allows for the perpetual cycle of planting, maintaining and replacing trees. We live in a mobile home park. There are California State rules for them which must be followed by all park owners. One of them is that if a tree poses a danger to people or property, the owner of the park must remove it. We had 2 trees removed from our space for free this way. You should look up the rule yourself to see if you qualify. I am a Roswell resident and have ten pines (in excess of 70 feet tall, and about a foot and a half in diameter), plus a bunch of scrub pines on my property that we want removed. I don't care to be paid for the lumber, I just want to know if there is someone who will come and cut them and take them. We recently had trees removed from our front yard - and they tree removal service had a lumber company come pick up our wood and sell it. Anyone have any thoughts? Hi - Sorry but I do not know where Roswell is located but I have had experience with having trees removed in Florida. Since you had trees removed before - have you ask the same company about these trees? There should be a list of companies in your telephone book or Google the info with your location. maybe local companies will be listed. Also look for names of any lumber companies or sawmills. 1. Usually is not a favorite for firewood so smaller companies do not cut them. 2. Pines may take heavier equipment and moving that kind of equipment is expensive. 3. Also, a log truck may have to be used and that is costly also. 4. Tree companies would have to weigh the cost of sending the equipment, truck and labor against how many "usable" trees are at that location AND how close they are to a house or buildings (insurance). 5. They would also need to know if their trucks could drive into your yard. I had pines similar to what you mentioned but finally had to pay to have them removed. Maybe there are more tree companies near you. I have 4 very large oak trees and two very large pecan trees in my back yard that I wish to have removed. Is there enough value in harvesting them to entice someone to remove them at no cost? Many larger lumber companies would probably want to work with someone who has more trees. You could call around and ask though. I have a lot of trees I need removed, but I have little income. I want to find some people who will take them for the wood. Can you help me with suggestions? Look in the newspaper or phone book for people who sell firewood. They might be interested in getting "free" wood to sell this winter. Or they might be able to direct you to someone who wants it. Try posting it on Craig's List. I have around 30 pine trees in my yard, close to my house. I would like them all gone. Are there companies who would do this in exchange for wood? Put an ad in Craigslist or Freecycle. *Tree removal companies are not interested in paying the owner in small jobs, such as a few acres of trees, as their costs in insurance, machinery and workers are very high. *Some companies may be interested in a larger project if the land owner pays the company, however, the land owner might then find that the company sells the trees to lumber companies. The tree company then has the tree removal payment and the lumber sale payment, as well. *Insurance liabilities on both sides can be very high as tree removal is a dangerous job and companies must carry high insurance costs for injury to workers and property. The property owner may face injury and damage costs, and legal problems, as well. Tree removal companies are required to carry insurance and bond for their company and workers but this does not mean the property owner does not need coverage for the property and possible injuries etc. *Depending on the area or state of the property, the owner may face permit requirements, historic, cultural and other limitations in removing trees from a property. So, an answer to your question is not simple. You may find a tree removal service by putting an ad on Craigslist, etc., but you still face all the issues above with no guarantees. *Frequently property owners may find they need an attorney to address the issues and prepare a contract. You should discuss your plans with an attorney familiar with land use and then make an informed decision. A caveat here-be careful not to provide the property address or even the general location of the trees to any company or person you might find from Craigslist, etc., before signing a contract. You may find that someone has removed the trees from your property without your knowledge. There may be some. You have to post flyers on your local Craigslist and ask, word of mouth or Facebook to see if there are any takers. We barter ours. I advertise locally on our facebook swap. My ad usually states that I have some trees on the ground, or trees to cut and the person who comes and cuts them gets the wood for free. All I ask for in return is that they keep the pasture gates closed, don't drive across the hay field and leave me about 1/3 of a cord as we burn wood during the winter. As a result, I usually have about 1 person a month who comes and cuts wood. My husband has not had to cut wood in years and we have not had to buy any. We farm and have numerous hedge rows that always need thinning out, and tornadoes or spring storms seem to take a few trees out of our woods each year. This works well for us. I have 2 sweet gum trees that are about 10 feet from the house . One is about 60 ft tall and the other is about 45. What is a fair price to have it topped or even removed? The last time I got a bid for removing trees that big, they wanted $1,000 a tree, which seemed high to me. I think you can get them done significantly cheaper if they aren't close to any houses, but when they are, it's usually a 2 or 3 person team and fairly expensive and time consuming because of the care they need to use in removing branches and cutting the tree down in small sections. Having said that, get several bids, just make sure that who ever you choose is bonded, so that you are covered if they drop the a chunk of tree on a person, house or something else they are supposed to. The time of year, where you live and the number of business specializing in tree removal in your area and drastically change the price you are going to have to pay, so multiple bids is a must. And if someone bids lower, but you had a better feeling about a tree removal service that bid higher, call and ask if they'll match the lower bid. It's not rocket science, but it's important to have someone who you are confident in what they are doing. I had 5 trees of pine and oak cut down at a cost of $500. It was a two man team. You really have to contact your local arborist and have them quote you a price. Then select the lowest bidder. Prices will vary. Check with your local extension service before accepting that lowest bid-the cheapest often isn't the best and you could be dealing with people who don't know how to safely remove trees of that size. The extension service will have a page on its website telling you how to safely remove a large tree, and that information is what you should use in choosing a service. The company that knows how to safely remove trees that big will be happy to describe the process they would use for your job-if they either don't describe the right process, or are unwilling to tell you precisely how they will remove your trees then that is not a company you should trust to do a good, safe job. Taking down a tree is complicated, dangerous work. It has to be done carefully or you will have a real mess! An inexperienced or unskilled tree removal can cause quite a lot of damage-tree roots could be wrapped around your gas and water lines for example, a qualified company knows how to figure this out before causing you unexpected surprises. Part of the job estimate should include removing the debris (but see below for more info on removal of debris), and grinding any stumps left in the ground. You can usually work a discount by asking the company to run smaller debris through a chipper and then using the resulting chips as decorative mulch; any good company will also offer to cut and stack the wood for seasoning to use in your fireplace. They will charge you for that. Some tree removal companies will try to charge you for removal of 'debris' that they will actually sell on as firewood-make sure your contract precludes them making double dips! If they are going to sell your 'debris' on, you should get a bit of a discount on the removal. A friend has dire need of having a catalpa tree taken down. It is huge. His budget is very very tight. Has anyone found a cheap, free, creative way to handle such a dilemma? It would involve wires (electric and phone). However it is a healthy tree so it would not be considered as a danger that needed to be removed by the utility companies. I have a extremely large tree in my back yard and I would like for it to be removed for free. I live in the city of Detroit, Michigan. Does anyone know how I might have this done, or what company I can call? First I would ask some people you know (neighbors, coworkers, church members) if they can recommend anyone. Second I would check your Yellow Pages for someone who knows how to do this. Don't let an inexperienced person attempt this if it is a large tree as you say. Serious damage can be done if the process is not handeled correctly by someone who knows what they are doing. Bonus if they have a company because then they have insurance in case they drop the tree on your house, a power line or a jay walker. Alt of people advertise in craigslist about your situation. Make a post letting licensed people know that you have a tree in the backyard you need removed for free and that they can cut it down for free firewood. You'll get plenty of responses. Just make sure the person is licensed and insured. I live in Valdosta, Georgia and I have about 25+ pine and about 5 or 6 oaks trees at the home that we just purchased. Is there somebody that I can call to cut these trees and haul them away for free? I have a large oak tree in my back yard and want to know if there is anyone that would remove it for fire wood. *Some companies may be interested in a larger project if the property owner pays the company, however, the land owner might then find that the company sells the trees to lumber companies. The tree company then has the tree removal payment and the lumber sale payment, as well. *Frequently property owners may find they need an attorney to address the issues and prepare a contract. You should discuss your plans with an attorney familiar with land use and then make an informed decision. I live in Louisville, Kentucky. I live in the city and I have a large walnut tree in my back yard. I really just want the tree cut down and the company that cuts the tree down can have the wood for profit if there is a company that will cut it down for free. I have three huge oak trees that are between 50 and 75 feet tall that have died. I would like to find someone that would remove these trees that is licensed and bonded that would not charge me for the removal. Any suggestions? We have 13 pine tree's we would like to have removed from our yard. They would make great utility poles. We live in Elberta, Alabama. In my area of western New York, I frequently see ads on Freecycle and on the free section of Craigslist for free trees/free firewood. You could look into placing such an ad and see what responses you get, assuming you have these groups in your area. Hope this helps.